Analysis of Economic Data has, over three editions, become firmly established as a successful textbook for students studying data analysis whose primary interest is not in econometrics, statistics or mathematics. It introduces students to basic econometric techniques and shows the reader how to apply these techniques in the context of real-world empirical problems. The book adopts a largely non-mathematical approach relying on verbal and graphical inuition and covers most of the tools used in modern econometrics research. It contains extensive use of real data examples and involves readers in hands-on computer work. 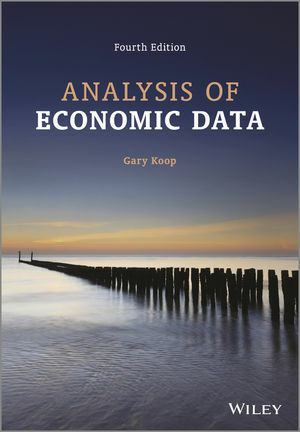 Gary Koop is Professor of Economics at the University of Strathclyde. He previously held professorial positions at the Universities of Toronto, Edinburgh, Glasgow and Leicester. He has also held academic posts at the University of Cambridge, the London School of Economics, Boston University and Queen's University, Canada. Gary is the associate editor of the Journal of Econometrics, Econometrics Reviews, the Journal of Empirical Finance, Studies in Nonlinear Dynamics and Econometrics and the Journal of Applied Econometrics. He is the author of: Introduction to Econometrics, Bayesian Econometrics and Analysis of Financial Data, all of which are published by Wiley. The use of econometrics software packages have been introduced to the book and will expand the coverage in the text beyond the use of spreadsheet software. A clear departure from traditional econometric textbooks, relying less on mathematics and more on verbal intuition and graphical methods for understanding. Covers most of the tools and models used in modern econometrics research e.g. correlation, regression and extensions for time-series methods. Contains extensive use of real data examples and involves readers in hands-on computer work.